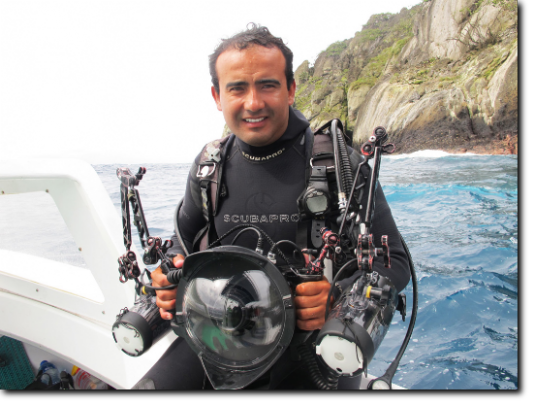 Born in Colombia in 1976, Edwar has shown special interest in the ocean and his passion and love for the sea led him to become a Marine Biologist in 2002 at the University of Bogota Jorge Tadeo Lozano. Edwar has been living, traveling and working as a photographer, videographer, recreational scuba instructor, technical diving instructor, & yacht captain over the years in different countries and has a wide range of experience to guide underwater expeditions but what he loves most is wildlife photography, especially if it’s in the water. In addition, he has been working with different underwater film productions including: Mayan Blue (movie), CNN (Anderson Cooper 360, shark finning), BBC - Animal Planet (Caught in the Moment), National Geographic, French TV (Ushuaia Nature), Marine Investigators, Japanese TV and guide many underwater expeditions with the most famous Underwater photographers. His commitment to the ocean has made him active in marine conservation with several organizations. Read about Edwar in La Nacion, Ancora, A.M. Costa Rica, and Al Dia. Exhibit Opening: November 20. 2011.